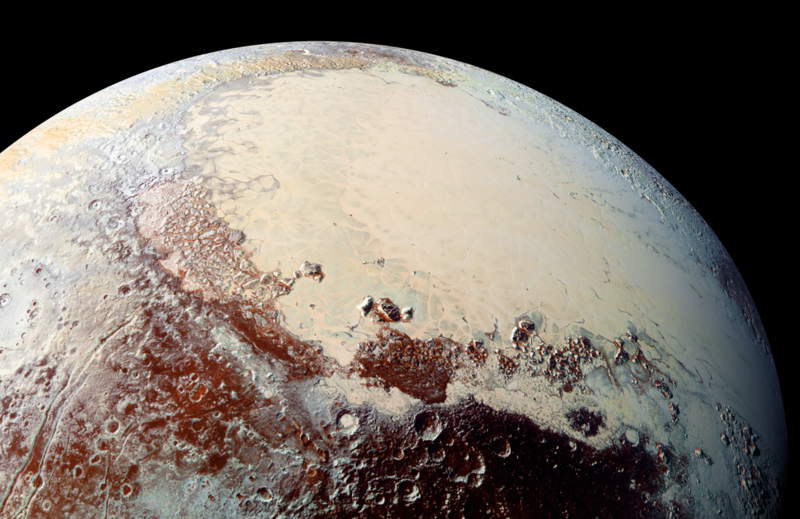 This high-resolution image captured by NASA's New Horizons spacecraft combines blue, red and infrared images taken by the Ralph/Multispectral Visual Imaging Camera (MVIC). Pluto's surface shows a remarkable range of subtle colors, enhanced in this view to a rainbow of pale blues, yellows, oranges, and deep reds. The bright expanse is the western lobe of the "heart," informally known as Tombaugh Regio. The lobe, informally called Sputnik Planum, has been found to be rich in nitrogen, carbon monoxide, and methane ices. Using computer models, Hamilton and coauthors found that Sputnik Planitia's initial location could be explained by Pluto's complex climate, itself forced by the 120 degree tilt of Pluto's spin axis. (For comparison, Earth's tilt is 23.5 degrees.) Modeling Pluto's temperatures showed that when averaged over Pluto's 248-year orbit, the 3 0 degrees north and south emerged as the coldest places, far colder than either pole. Ice would have naturally formed around these latitudes, including at the center of Sputnik Planitia, which is located at 25 degrees north latitude.